The inspiration for this soup came from two sources: a favorite soup recipe in The Greens Cookbook, and Kim Carlson, Culinate's editorial director, who frequently calls me in the early evening seeking dinner advice. More than once Kim has queried me on ways to pair winter squash with dark, leafy greens; to her credit, she came up with her own delicious recipe for Butternut Squash Lasagne. Preheat the oven to 400 degrees. Place squash and garlic cloves on a large baking sheet. Drizzle with a little olive oil and rub the oil into the cut sides of the squash; place cut-side down on the baking sheet. Bake for 30 minutes or until the squash is tender when pierced with a knife and the garlic is soft. (If the butternut squash is on the large side it may take longer to cook, but remove the garlic after 30 minutes.) Once the squash is cooked through, remove from the oven and set aside to cool. While the squash is cooking, wash, dry, and chop the vegetables and herbs. Heat a large soup pot and add enough olive oil to coat the bottom. Sauté the chopped onion, carrot, celery, sage, and thyme over medium heat, stirring occasionally, until the vegetables are just tender. Add the chicken stock along with the cooking liquid from the beans; add enough additional water to equal 6 cups liquid total. Bring soup to a boil, then simmer. Once the squash is cool enough to handle, scoop the flesh from its skin and cut into chunks. Add this to the simmering broth along with the roasted garlic, squeezed out of its skin and smashed with a large spoon against the side of the pot. Add the cooked beans and the chopped kale. Simmer for another 20 minutes to cook the kale and marry the flavors. Stir in the chopped parsley and season to taste with salt (it may take a lot if neither your broth nor beans were salted) and freshly ground pepper. To serve, toast baguette slices under the broiler. 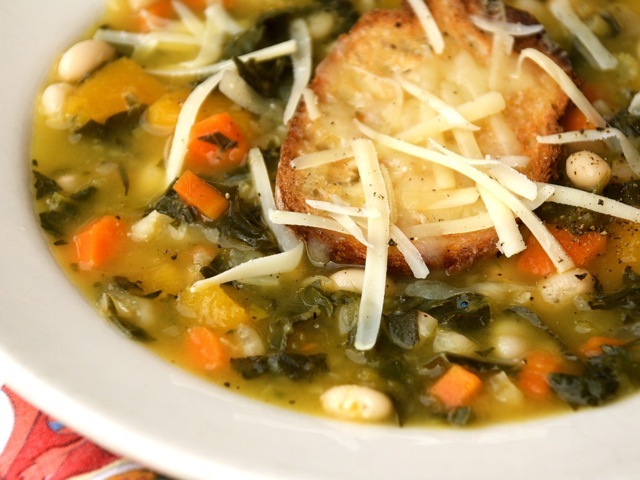 Ladle hot soup into bowls and top each with a slice of toast and a sprinkling of gruyère cheese. To turn this into a vegetarian soup, replace the chicken stock with vegetable or bean broth. I make chicken stock on a regular basis and store it in the freezer, which makes it a cinch to add to soup and other dishes.